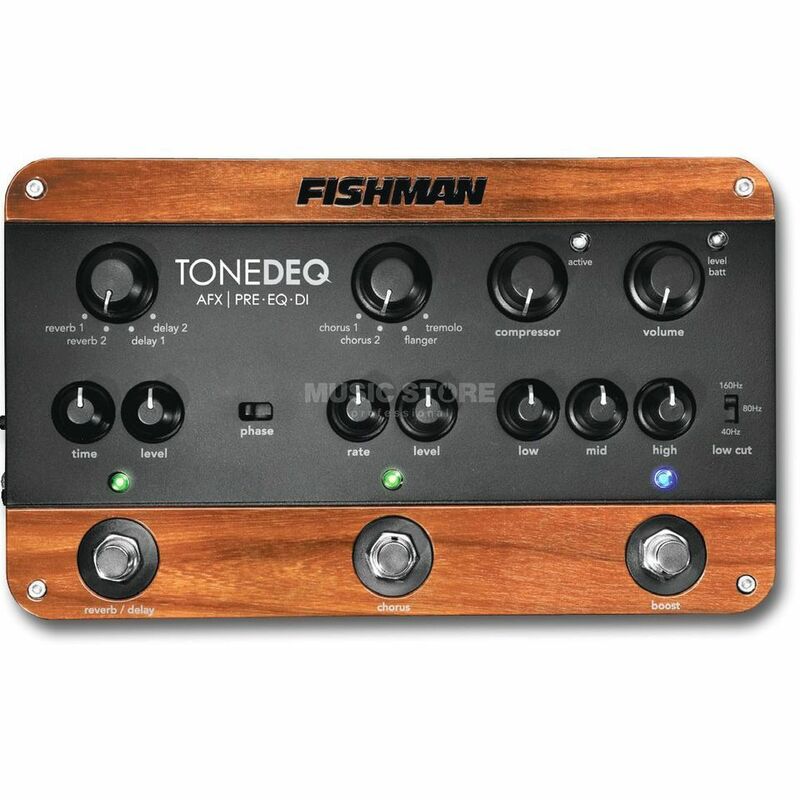 The Fishman TONEDEQ Acoustic Guitar Preamp Pedal is a world-class preamp pedal made specifically for use with acoustic guitars. This high-quality and innovative pedal features dual effects, a 4-band EQ and a soft-knee compressor and allows live guitarists to gain complete control of their tone. The complete performance solution for the acoustic musician; with a high-quality preamp, dual effects section, tone controls, a compressor, level booster and a balanced DI — it’s got everything you need in one box. Its analogue signal path goes from end to end – from preamp to output – to give acoustic musicians a richer tonal quality. Even the digital effects are mixed in parallel so they don’t affect the purity of your acoustic instrument. Flexible outputs include a 1/4 inch amplifier output and XLR DI output for the lowest noise possible. Plus the DI features automatic ground-lifting and selectable pre/post EQ settings. With Fishman, you get quality discrete Class A signal conditioning created by the leader in instrument preamp design. The high impedance input is a must for any passive instrument pickup. Legendary 4-band equalizer design provides superior tone control for any acoustic instrument. The variable low cut filter controls sub-bass effects produced by some passive pickups.